In as much as I hate to begin this rebuttal this way, I must say it that my friend Charles Ogbu lied in his most recent article he titled "WHY IGBO YOUTHS MUST NOT BOYCOTT ELECTION IN ALA-IGBO". I respect friendship and I also respect the personality of Charles, but I can not just see him lie and let it go unchallenged, especially in a crucial matter as this. Charles wrote that in his one-on-one discussion with Nnamdi Kanu, the leader of IPOB listened to Prof Ben Nwabueze to cancel the planned election boycott. He used the word "listened" as to mask what he intended to say which is 'agreed' to cancel the election boycott. This is only but a fallacy. This is maliciously concocted by my dearest friend to sell to people his need for Biafrans to jettison election boycott as to embrace election. This is how he intend to drive home his point. We can still remember vividly the outcome of the meetings held between Mazi Nnamdi Kanu and the South East governors, where they begged him to put aside his planned boycott of election. If we have not forgotten so easily, we will remember that Kanu said he will get back to his people, because it is not a decision he can make by himself as IPOB has Directorate Of State that manned it. This does not imply he accepted. He simply said, I have heard you and will relate to my people and come back to you. How then did he 'agree' (listen) to them to cancel the proposed election boycott? If he agreed, then why say he will get back to IPOB body. Unfortunately, Nnamdi Kanu is not here to put the record straight, but all through he was out of prison, members of Family Writers Press and other IPOB Media have always been with him to cover all his events. On no occasion did Nnamdi Kanu agreed to cancel Election Boycott, he only agreed to take the appeal to his people. So tell me how my friend Charles Ogbu got to that conclusion that Nnamdi Kanu agreed to jettison Anambra Election Boycott? An outsider or gullible fellow will just conclude that Nnamdi Kanu would have cancelled the election boycott had it been the army didn't struck. Someone would have concluded that the governors made Nnamdi Kanu understand that election boycott is a foolish idea, when it is not the case. Comrade, this is where you goofed big time. We are free to pitch our tenth with anyone and with anybody we deemed fit, but we do not have that right to lie against someone, especially someone kidnapped or probably dead as to score cheap points. I am one of those that are not swayed by beautiful words and erudition. I easily pinpoint lies even when they are hidden in lines of poems. Having said this, I will like to reiterate that it is in the advantage of Ndi Igbo and Biafra in general to seriously boycott this election. We all know that for more than 50 years and still counting, Nigeria has been going on and on to vote, and for more than 50 years they can not boast of voting in their desired candidate. It has been a self imposed leader, someone we all always embrace forcefully. They say that the "biggest mistake Igbo youths will make is boycotting election of people who will be directly responsible for piloting their destiny". The above quote looks logical and beautiful, but can you please throw in some questions as to know if the above statement can still stand logical when placed side by side with our ordeals and experiences in Nigeria as pertaining to elections in Nigeria. Can Charles Ogbu and those who believe in his line of thought tell us how these people we have been electing since in 70s till now have been piloting the affairs of the Igbo people and Nigeria in general? Tell us if the likes of Governors Willi Obiano, Rochas Okorocha, David Umahi, Ifeanyi Ugwuanyi and Okezie Ikpeazu are not product of election. Are they not not directly responsible for piloting our affairs? What has these products of our election done for us? What did they do during operation Python dance II? Are they not the persons that sat and proscribed their own youths who did nothing? Didn't their action put us all in harms way? Didn't we all see the fighter jets hovering over Onitsha and Aba? What have we really got since we have been voting? Charles, I want to let you know that in the history of election boycott around the world, election boycott have never recorded 100% and it can never record such percentage. IPOB is not seeking for a 100% election boycott. We are not even boycotting to unseat Buhari. If you say that if IPOB boycotts, still there will be results, I then also say that if you still vote, as you have been doing for many years now, there will also be results that will produce their own choice and not yours. Is it then proper for us to continue legitimizing their rigging through voting or should we not absent ourselves completely from an election that has continuously yielded nothing but failure. 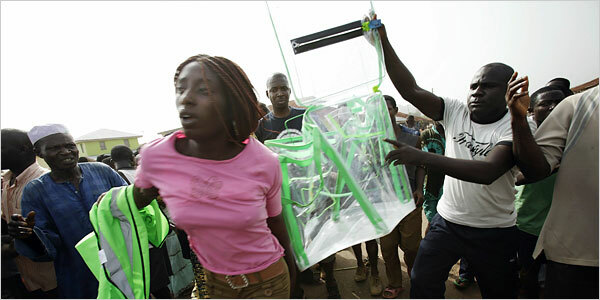 "Nigeria is too primitive for election boycott by any group of people to have any meaningful impact." So tell us those meaningful impact election in Nigeria has produced if not killing, marginalization, inequality and corruption? For more than miserable 50years we have been voting under the sun and rain. After every election, results that are completely different from the wishes of the people are announced. For how long will this continue? Did we just remembered meaningful impact because IPOB called for election boycott? Haven't these people rule us for four years and go on to contest and win again even when they performed badly in their first tenure? How is it that we have been this way since we have been voting? How did IPOB election boycott suddenly become a problem? Haven't we been bounded by every decision these stooges takes? So what will be different if we boycott and they go on to shamelessly appoint their own stooge like they have been doing since we started voting? For your information, I personally have my PVC, and I am going to boycott with it. Charles I put it to you that if you truly acknowledge that the country called Nigeria has neither hope nor future for Ndigbo, then you wouldn't have come up with this thought of asking Igbos to jettison the simple revolutionary action they have embraced to run back to voting again. Boycott is not us cutting our nose to spite our faces. The present governors were s-elected and they sent the military to kill Igbo youths. Elect another and they will still be the puppet of the Fulanis against the wishes of their own people. We have never regarded self determination to be a marathon race. You rightly said "what we have as leaders in Igbo land are a bunch of 'Ndi-abani-di-egwu'. You called them political bandits and crude criminals." And I ask, who then do you want us to vote in? Same political bandits and crude criminals or are you going to import saints from heaven? Don't forget that most of these leaders were not bad before they ventured into politics. Who then corrupted them? Did you cared to trace it? Don't forget that both Governor Rochas Okorocha and David Umahi are products of the same election you are telling us to embrace. IPOB and other people like me that will join in this boycott are not boycotting because of the notion that boycott with birth Biafra as some of you are thinking. We are not even boycotting because election will be rigged. We are boycotting because we want to register our displeasure with the happenings in Nigeria and even if the shameless Nigerian government through INEC decides to call results, how then will it defeat our goal? Biafrans will not die because of elections or in the name of protecting useless votes in Nigeria. We have been voting yet we still remain under these rogues. We will not adopt the Bayelsa style, we will rather stop permanently this defeatist elections that have seen us produce 'foreigners' who do not mean well for us. My dearest friend, this is exactly the point you will have to chose were you truly belong? Are you for Biafra or are you for Nigeria? Are you for Nnamdi Kanu or are you for Nnia Nwodo? This position MUST be taken now and fast. You can not dance further without choosing your side before you put us all into confusion. And I want to tell you that whatever part you chose to be, it is solely your right. But you must as a matter of urgency chose a side.